Employees who are motivated and feel good at work help to contribute to long-term, sustainable business. The right skills and a good work environment provide conditions for job satisfaction and commitment. BioGaia’s aim is to be an attractive employer who can both attract new talent and retain the right skills in the company. During 2018, BioGaia was evaluated by the company Great Place to Work. This included an employee survey, which was answered by 99 percent of employees in BioGaia AB, and an external review of the corporate culture. The evaluation resulted in BioGaia being certified as a “Great Place to Work”. In the employee survey, BioGaia as a workplace received a very high rating, for example 88 percent of employees stated that they can maintain a good balance between work and leisure and 95 percent said that they look forward to going to work. BioGaia has a tool for structured performance reviews which is also used to ensure the quality of follow-up from both managers and employees. In 2018 all employees had such a review with their immediate manager. The number of employees at 31 December 2018 totaled 143 (120), 84 women and 59 men. The Group acquired 36 new employees during the year of whom 16 in BioGaia AB, 1 in BioGaia Pharma, 6 in BioGaia Production, 10 in BioGaia Japan and 3 from the acquisition of MetaboGen. 13 people left the Group during the year. 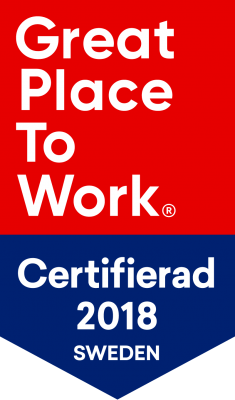 Certified by Great Place To Work. In the employee survey (Trust Index) conducted by the external company Great Place to Work, 87 percent stated that BioGaia is a very good company to work for. 1.8 days Average short-term sickness absence per employee. Average short-term sickness absence in BioGaia AB is low. In 2018 it was 0.7 percent (1.8 days). We see good relations with our employees as a success factor and it is the employees who are the key to continued success. BioGaia is an innovative Swedish healthcare company and has been a world-leader in dietary supplements with probiotics for nearly 30 years. BioGaia’s business model is based on long-term relationships in three external networks – research, production and distribution.